Paros is widely considered the “transportation hub” of the Cyclades islands because the majority of island boats stop here. 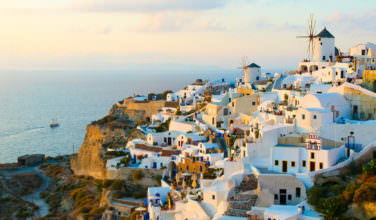 It’s also been called the “poor man’s Mykonos”. Yet, interest in the island (and prices) is on the rise. 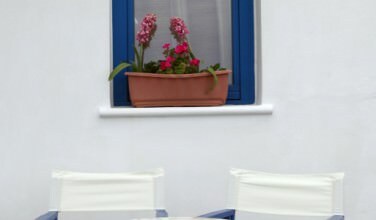 Paros has plenty to offer and shouldn’t just be viewed as a stop on your way to wherever you might be going. Parikia is the main port and capital of Paros. It’s both cozy and cosmopolitan. 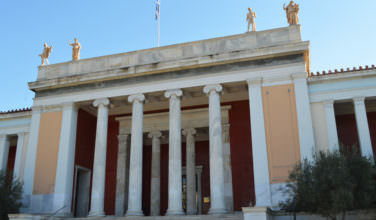 It has an “artsy” side and is the home of the Aegean Center for the Fine Arts. The Archilochos Cultural Society hosts a winter film festival and a summer music festival. Many galleries sell the work of local artists. 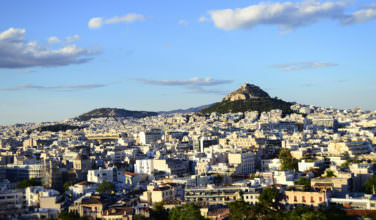 Top attractions in Parikia include the Archaeological Museum and the Pagagia Ekatondapiliani Cathedral. This 100 doored church or “Our Lady of a Hundred Doors” was founded by St. Helen, the mother of Constantine the Great, and designed in the 6th century by the famous architect Isodore of Miletus. It was restored in the 1960’s and its large square was expanded in 1996 for its 1,700th birthday. Outside of Parikia, other island attractions include the Marathi Marble Quarries and Psychopiani. The marble quarries at Marathi are the source of the famous Parian marble that was prized by ancient sculptors for its translucency and fine, soft texture. It was used for the famous works of art, “Hermes of Praxiteles” and the “Venus de Milo”. Psychopiani has plum, pear, fig, and pomegranate trees and is known for its butterfly (tiger moth) population. These insects have been going there for at least 300 years. They are most numerous in early mornings or evenings in June. 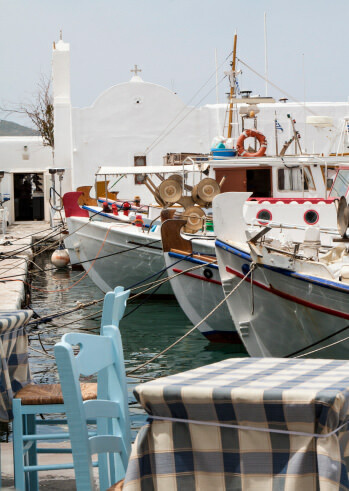 Two must-see villages on Paros, outside of Parikia, are Naoussa and Lefkes. Naoussa is a fishing village but it is a growing resort area where most nightlife in Paros can be found. Nice restaurants, bars, and shops are always popping up. Yet, it retains its charm. Lefkes is the medieval capital of the island. It was built with an intentionally confusing pattern of streets to thwart the threat of pirates. Paros offers a good selection of beaches that are the perfect spots to get away and have a good time. The closest beach to where the ferries dock is Livadia Beach, only a 15 minute walk and very convenient. Chrissi Akti (Golden Beach) is on the island’s southeast coast. It’s considered the best beach on the island. It can be very windy here which makes it a popular destination for windsurfers. In fact, it’s where the World Cup championship is held each year. Buses run here from Parikia and Naoussa. You can also catch the bus from these cities to Kolimbithres, another famous beach on the island. It is known for its giant rocks that divide the golden sandy beach into several tiny coves. Kolimbithres is featured on many island postcards. Santa Maria beach is known for its clear water and shallow dunes, which are rare in Greece.